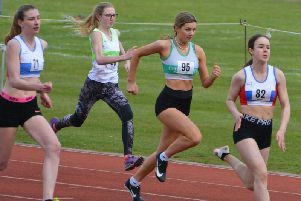 The old saying that if you aspire to be the best, you must compete with the best, was certainly the case for Chichester Runners & AC young athlete Fleur Hollyer, who competed at her first England Athletics Championships held at the English Institute for Sport in Sheffield. With a personal best well inside the qualifying championship entry standard, she was drawn in lane six of a tough heat of the under-15s 60m. Using starting blocks for only the second time in her career, she had a very competent drive and pick-up phase, and along with a good finish she claimed fifth place in 8.49sec, just 0.05 off her PB.